UNITED NATIONS, Jan 6 2017 (IPS) - Millions of Yemenis could soon face widespread famine if no action is taken to improve food access through humanitarian or trade means, an early warning system has said. 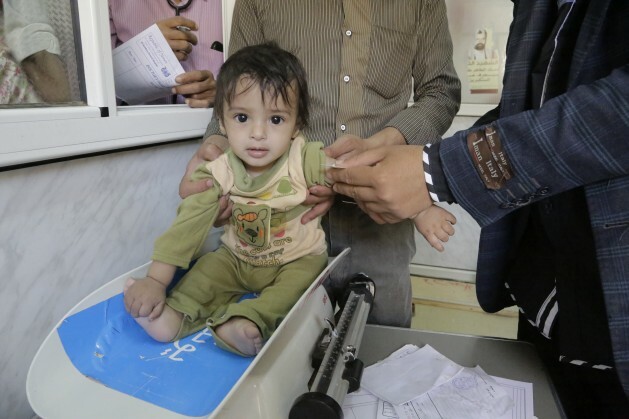 Up to eight million Yemenis are severely food insecure while another 2 million are facing food insecurity at emergency levels, just one phase below famine, the Famine Early Warning Systems Network (FEWS NET) has found. The World Food Programme (WFP) estimates that the food-insecure population in the Middle Eastern nation could be even higher at up to 14.4 million, representing half of the population. This has contributed to rising acute malnutrition and risk of mortality. According to the UN Children’s Fund (UNICEF), almost 4.5 million are in need of treatment for malnutrition, including over 2 million children. The ongoing conflict between a Saudi-led coalition and the Houthis has largely driven the food crisis in Yemen, which FEWS Net describes as the “largest food security emergency in the world.” The two-year civil war has left thousands dead and 3 million displaced, limiting humanitarian access and food availability on the market. The U.S. Agency for International Development (USAID)-funded system highlighted the need to improve humanitarian access in order to continue and increase much needed food and nutrition assistance. Prior to the conflict, Yemen imported approximately 90 percent of its food. Though current food assistance from organisations such as the World Food Program (WFP) is helping mitigate the crisis, FEWS NET noted that such operations alone have been insufficient to meet the country’s needs. Action is also needed to ensure sustained commercial food trade. Prior to the conflict, Yemen imported approximately 90 percent of its food. The unrest has since disrupted the government and private sector’s ability to import food. Most recently, wheat imports were suspended in December, a staple grain for Yemenis. Without such imports, humanitarian actors will also be unable to ensure local food availability. Though food is still available on local markets, increased prices and reduced income have limited access to goods. WFP found that prices of red bean, sugar and onion were respectively 48 percent, 24 percent and 17 percent higher in November than in the pre-crisis period. A major reduction in food import levels will only serve to worsen food security in the country. “In a worst-case scenario, where food imports drop substantially for a sustained period of time or where conflict persistently prevents the flow of food to local markets, famine is possible,” FEWS NET reported. In 2016, the UN requested almost $1.7 billion towards Yemen’s Humanitarian Response Plan. Approximately 40 percent remains unfunded.